Patient will present as → a 3-year-old with fatigue, irritability, and a low-grade fever that he has had for 3 days. According to the patient's mom, the child attends a daycare where a virus is “going around.” On physical examination, the child does not look ill. His temperature is 98.6 F (38 C). 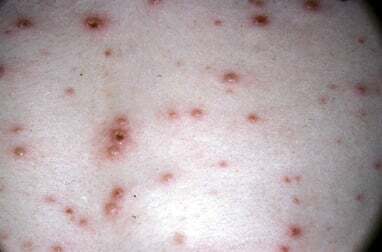 His skin examination shows scattered, small vesicles on an erythematous base. The rash was seen first on the face and seems to be spreading to the trunk. Alternative presentation → a 67-year-old male who presents to your clinic with a two-day history of a painful rash on his left flank and radiating to his back. This was preceded by a burning pain in the same region several days prior. The patient does not recall any history of childhood exanthems and is not up to date on his immunizations. Vital signs are stable. 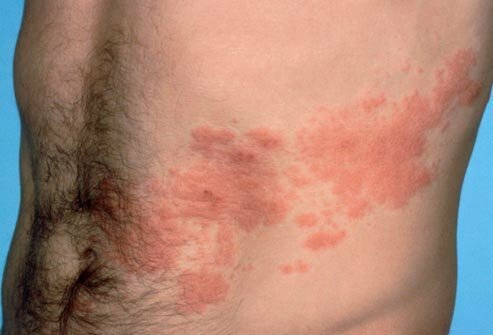 Physical exam reveals a maculopapular rash in a dermatomal distribution on the left flank and extending into the back. Confirmatory laboratory studies are rarely done but serology and fluorescent microscopy will confirm the diagnosis. 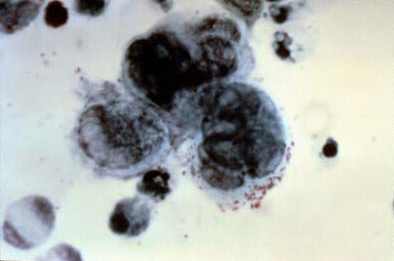 Herpez Zoster can be identified via tzanck smear with visualization of multinucleated giant cells. Chicken Pox: symptomatic treatment, may use acyclovir in special populations. Shingles: Acyclovir, Valacyclovir, Famciclovir given within 72 hours to prevent post-herpetic neuralgia. Zoster Opthalmicus: oral antivirals, may add acyclovir ophthalmic. Zoster Oticus (Ramsay-Hunt Syndrome): oral acyclovir and corticosteroids. Postherpetic Neuralgia: Gabapentin or TCA, topical lidocaine gel, capsaicin. Herpes zoster vaccine is a live, attenuated virus vaccine - vaccination is recommended for immunocompetent adults > 60 years of age. 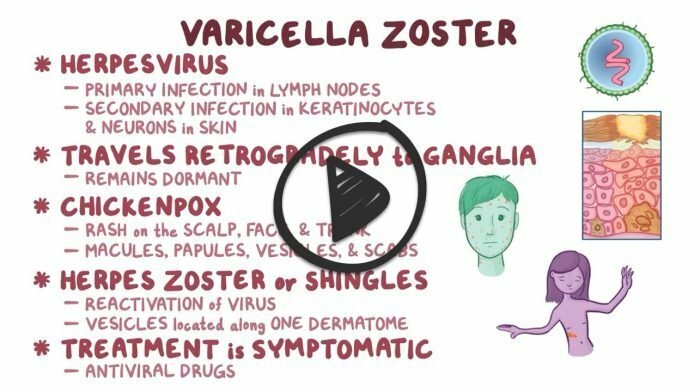 Varicella zoster virus (VZV) is third of the eight viruses in the herpesviridae family and is the cause of chicken-pox and shingles. This virus is an enveloped double-stranded linear DNA virus. 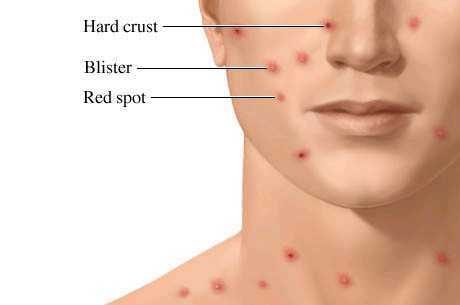 Primary VZV infection results in chickenpox, which is a highly contagious illness that typically begins with a vesicular skin rash on the head and body. The rash is usually extremely itchy and can umbilicate and form scabs. Adults that get infected with primary infection commonly have more severe disease manifestations with more widespread rash and are more likely to experience complications such as pneumonia or encephalitis. Even when clinical symptoms resolve, the virus remains dormant in the trigeminal and dorsal root ganglia and can reactivate later in life to produce shingles, commonly called herpes zoster. Shingles is characterized by a painful blistering skin rash with a specific dermatome distribution on the body. Although the rash usually heals, some can suffer from residual nerve pain in a condition called postherpetic neuralgia. The organism can be identified via tzanck smear with visualization of multinucleated giant cells or the presence of cowdry A inclusions. 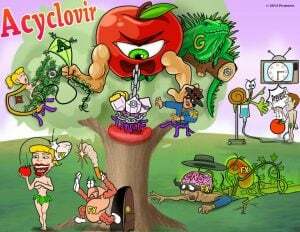 Antiviral drugs like acyclovir can be used to reduce the severity and duration of VZV infection. Chickenpox or varicella is a highly contagious communicable disease affecting children. It is communicable approximately 1 day before the eruption of the lesions to 6 days after the first crop of vesicles when crusts have formed. Typical incubation is 14-16 days. The disease is transmitted by direct contact [skin lesions, not the scabs], droplet (airborne) spread, and via contaminated objects. Acyclovir (Zovirax) is an antiviral medication that inhibits viral replication in organisms of the herpes virus family. This medication is indicated for infections caused by herpes simplex virus and varicella zoster virus. This drug comes in several forms including topical, oral and intravenous. Side effects of oral acyclovir include nausea, vomiting, diarrhea and headache. Side effects of IV acyclovir include nephrotoxicity and neurotoxicity. Special consideration include preventing recurring episodes of herpes simplex virus and administering IV acyclovir at a slow rate. A patient presents with clustered skin vesicles on the left hypochondrial region. There is associated pain, itching and paresthesia. Which of the following drugs is recommended in treating this patient? There is no role for corticosteroids in the management of herpes zoster infection. The patient’s diagnosis is herpes zoster (Shingles). Valacyclovir is used in treating herpes zoster infection. Antiviral therapy decreases the duration of symptoms and the likelihood of postherpetic neuralgia. Which one of the following is recommended for the treatment of postherpetic neuralgia? Gabapentin is recommended for the treatment of postherpetic neuralgia. Other medications that can be used include tricyclic antidepressants, capsaicin cream and several others. All other options are not recommended. Concerning varicella, which of the following statements is incorrect? Varicella-zoster vaccine is a live attenuated vaccine. The varicella vaccine is given in two doses. A child should have the first shot at ages 12-18 months. The second shot should be given at ages 4-6 years. Older children and adults should have two shots, with four to eight weeks between the first and second shot. 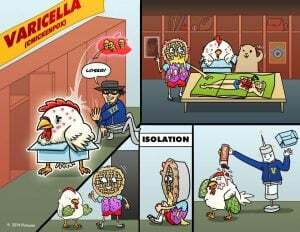 The incubation period of varicella is 11-20 days. All other statements are correct.